It is a birthday season. I mean, I would like to say, that it is the birthday season, but it is actually my sister's friends that all have birthdays. So she decide that she wants to try to make them a cake. 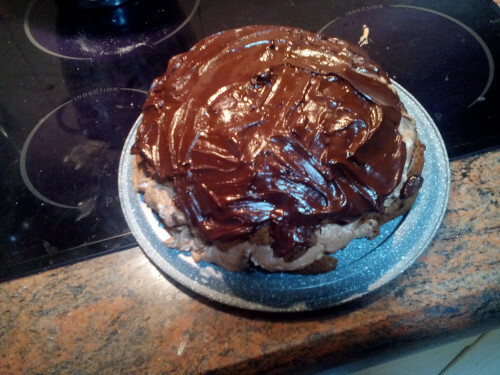 Since it is for her group and she and most likely a lot of her friends like nutella, it had to be the nutella cake. For me, it was a time to spend with my sister doing the stuff that was fun to me. It was fun, even when she complained that she needs to wait 15 minutes without doing anything. My mother suggesting that she can talk to her was not helping. It does not look that nice, as you can see on the recipe. But it was tasty. When mixing whipped whites, make sure to be tender. The air should stay inside in order to make it more fluffy when baked. The similar can be said for the whipping cream. Me and my sister also added the banana on the shipping cream mixture. I don't think it helped the taste.